The Kong is dead, long live the Kong! 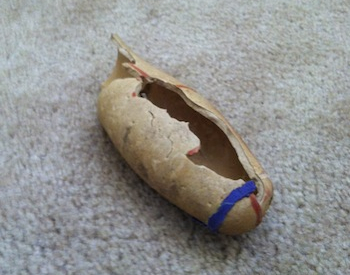 It’s true, our Great Dane puppy Luna’s somewhat beloved, yet irregularly used obloginal squeaker toy, has passed on. (Ed note: is obloginal even a word? If you know, please reply). 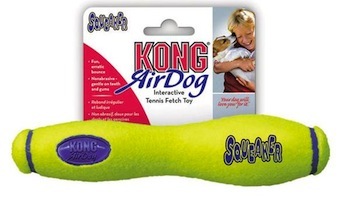 For reference, here is my original Kong Air Dog Squeaker Stick product review from March 2011. The yellow vessel of aural evil is evil no more. The squeaker has squeaked for the last time and will squeak no more. Let it be rung from hilltops everywhere that the Kong is dead. If you’re a fan of the Dead Parrott sketch from Monty Python, you’ll recognize the above. We acknowledge with equal solemnity the Kong’s passing. Luna had the toy almost a year so the end didn’t exactly come quickly. Given its potential for mind-numbing noise (see product review), it wasn’t as quick as I would have liked. What kept the end from coming quickly, though, was Luna’s relative disinterest. Disinterest, often benign neglect, characterized their relationship. The squeaker stick was good for two minutes of randomized diversion twice a month but it sure wasn’t what you’d call an indispensable friend. Without the attention of a “serious chewer,” which Luna fortunately is not, the demise was long and slow. First, she made a tiny breach in the fuzzy tennis-ball covering. From small openings, big things come. The purchase enabled Luna to penetrate a couple of weeks later through the outer material into the soft underbelly. The squeaker still emitted sound but the end was approaching. A few more weeks on, Luna took all of two minutes to tear the remaining yellow cover off. It was the kind of “serious chewing” attention a Kong like this is incapable of withstanding. At its core, squeaker toys are just shapes of gray rubber that contain a device to emit squeaks when pinched or squished. Remove the bright yellow fuzziness and it’s a bit like discovering the big secret (the short guy) behind the political structure of the Emerald City. It’s a letdown. Once the gray rubber was indeed revealed, Luna went Great White Shark on it and that was the end. An end that was “months in the making,” as marketers pimping big things like to loudly proclaim, came in seconds. Designed in the USA, made in China, and deconstructed in Northern California.